January means new beginnings, fresh starts…and the end of winter break. For many of us, January is just a signal for more school. Still in vacation mode? Shape up that flabby brain with Quokka Studios’ puzzle app, Strimko, a popular web-based logic game based on numbers. Strimko is very similar in nature to Sudoku, another popular numbers game–in fact, they share roots. Like Sudoku, you must fill in numbers on a blank grid, only Strimko has grids that go from 4×4 to 7×7. Another difference is that the blanks on Strimko grids are connected to other blanks, making a “stream” that holds as many blanks as the puzzle dimension. No number can be repeated in any row, column, or stream (use 1 through the puzzle dimension). Down at the bottom of the screen is a toolbar. The first two buttons are Undo and Redo. If you really need a hint, tap the lightbulb (third button). Tapping the timer will pause the game, while you can pick your choice of music (from your own library) with the music note button. Adding a number into a blank is fairly straightforward: just tap the blank space and then tap the number from the menu that pops up. You can also write yourself notes if you select the pencil icon from the menu–select the numbers you think would fit into the blank, and then anywhere else on the board to exit. There are four difficulty levels in the Core Pack: Easy, Medium, Hard, and Master, with 25 games in each one. Once you solve all 100 games, a Bonus Pack of 20 puzzles is unlocked. 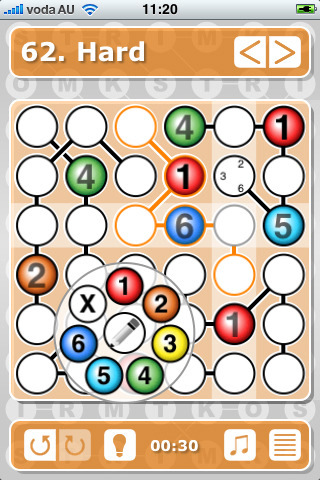 Anyone who has ever tried Sudoku will definitely be comfortable with the layout and gameplay of Strimko. However, I love that Strimko adds another dimension to the familiar game with the stream concept, and that harder levels involve more spaces to consider (playing a few rounds of Sudoku can be a little repetitive). The app is very well designed: it uses a main shade for every level, the same color for a number no matter the level, and easily discernible fonts. There is a Lite version available with nine puzzles (three puzzles for the first three levels) for free, but the full version is easily a great investment at 120 puzzles for $0.99 (they even throw in the Lite version puzzles, so it’s actually 129 puzzles). Strimko is a guaranteed puzzle-person pleaser, so whip that brain into shape and grab it today. AppSafari review of Strimko was written by Julie Guan on January 3rd, 2011 and categorized under App Store, Board, Featured, Fun, Games, Puzzler. Page viewed 3978 times, 2 so far today. Need help on using these apps? Please read the Help Page.